The best Homemade Pancake Mix from scratch that’s better than store bought! Why make a Homemade Pancake Mix? How many weekends do you crave for a stack of pancakes, but have to make the batter from scratch, measuring out each ingredient? Or you have to rely on that store bought pancake mix that doesn’t taste all that good! And as you know, those instant pancake mixes are the furthest thing from ideal. Whether it’s a busy weekday or a lazy weekend, I’d never say no to a deliciously fluffy pancake or a light, crispy waffle. Thanks to this homemade pancake mix there’s a quick and easy to way get my pancake fix on busy days and on weekends! Plus you know exactly what is in the homemade pancake mix that you made. So after A LOT of testing, I FINALLY made my own HOMEMADE PANCAKE MIX that easily doubles up as a HOMEMADE WAFFLE MIX too! 🙂 How awesome is that? This is easily the best homemade pancake mix recipe and it goes without saying that it’s better than anything store-bought. It makes light, fluffy pancakes with a hint of sweetness that you absolutely couldn’t resist. Plus, this homemade mix has just one extra ingredient, that makes pancakes that are lighter and fluffier than other mixes out there. Not only pancakes though – it also makes deliciously crispy waffles with the same batter mix too! PRINT OUT THIS LABEL FOR YOUR PANCAKE MIX JAR! Once you have printed it out, you can fold it in half too. Yes, I am a pancake and waffle purist of sorts, and I know that the batters for pancakes and waffles are different from each other. Pancakes need to puff up, but waffle batter needs more fat and is lighter so that you get light, crispy waffles. My favorite waffle recipe is a yeasted waffle recipe (coming on the blog soon), but it requires some planning ahead. So there’s no reason why week days (or afternoons or after hours) can’t mean pancakes and waffles too! 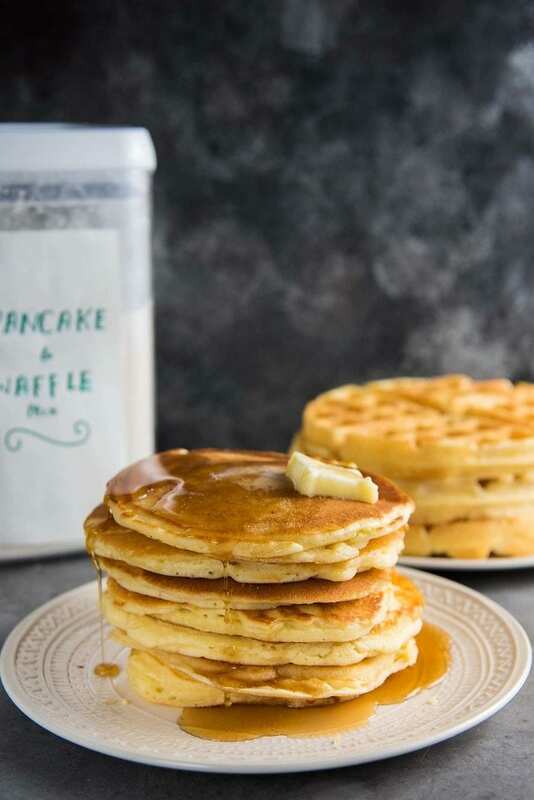 In this post, I’ll show you how to make homemade pancake mix from scratch, and how to make waffles AND pancakes from the same mix. So that you can enjoy from scratch waffles or pancakes whenever you like! Usually store-bought pancake mixes have a chemical after-taste that comes from preservatives. But that’s obviously not the case with this homemade pancake mix. 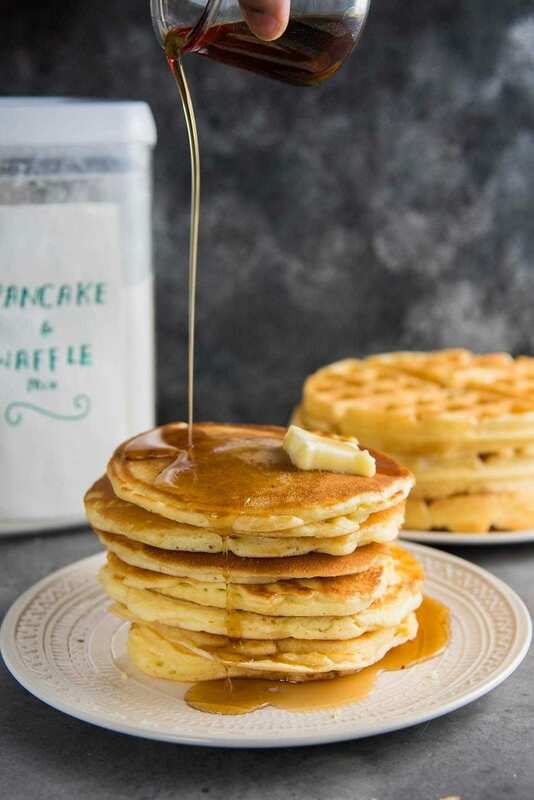 These pancakes are made with all the regular ingredients that you use to make pancakes or waffles, so that you get deliciously fresh and scrumptious results, every time. What’s so great about using homemade pancake mix from scratch? 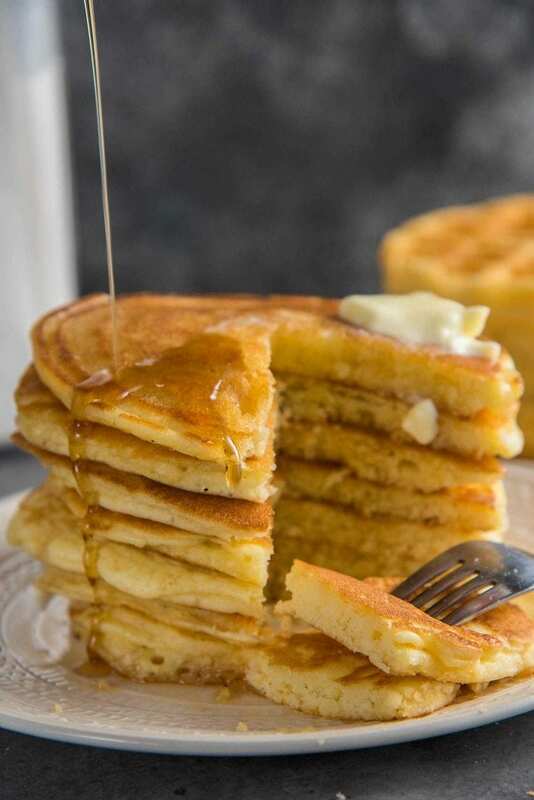 Store-bought pancake mixes have preservatives which make pancakes and waffles taste a bit “artificial”. 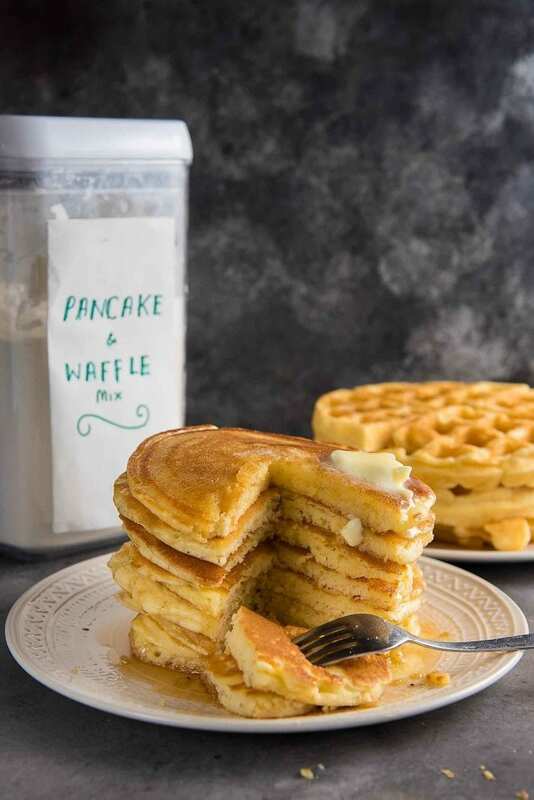 This homemade pancake mix (homemade waffle mix) uses the same ingredients that you’d normally use to make pancakes or waffles, so they ALWAYS taste delicious and you know exactly what goes in. 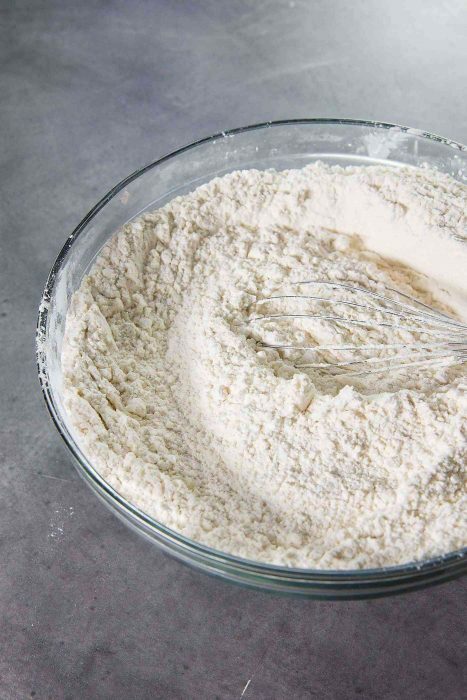 This pancake mix is just a matter of measuring the ingredients into a blender and then blend to mix well, and then transfer the mix into an air-tight container. Once you have a full jar of this mix, you can easily make a batch of fluffy pancakes or crispy waffles anytime you want! It saves you time from having to measure each ingredient into a bowl to make pancakes or waffles from scratch the regular way. You only need to measure one ingredient here – the pancake mix, and then just add eggs, butter and milk (all in one bowl). 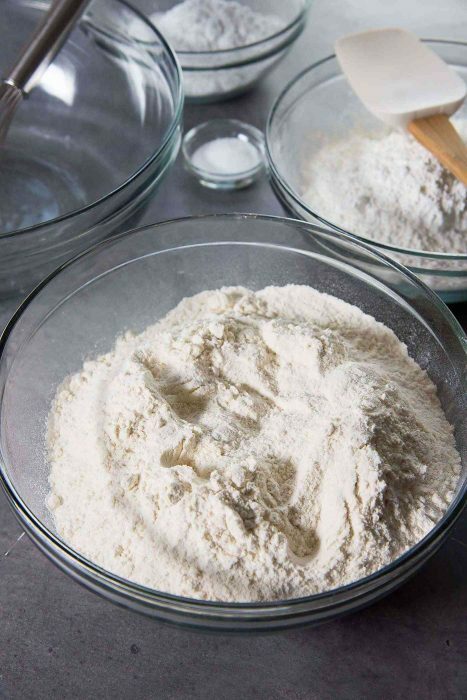 This homemade pancake mix uses cornflour or cornstarch. This lightens up the mix resulting in a lighter batter that gives you fluffier pancakes, and crispier and lighter waffles. If rubbery pancakes are a problem, then this mix is the solution! Rubbery pancakes happen because you over-mix the batter, and the flour forms too much gluten. The addition of cornstarch helps reduce the gluten formation as well. Just make sure to mix the ingredients only until they are just combined, and you will NEVER have rubbery pancakes again. Instead of using regular sugar, I use confectioner’s sugar to sweeten this DIY pancake mix recipe. I find that when I use regular sugar, it sinks to the bottom of the mix, even after blending it. But with confectioner’s sugar, you won’t have that problem. It distributes well with the flour and cornstarch. No baking soda – I actually do like baking soda in my pancakes or waffles. It’s a great leavening agent. BUT for this pancake mix recipe, I decided not to include baking soda. If you’re using buttermilk, baking soda is easily neutralized, but not everyone has buttermilk readily available at home. So I wanted to make an easy to make homemade pancake mix that will work with buttermilk OR milk. So there is no risk of your pancakes having a “soapy” taste because of the baking soda. I LOVE using this pancake mix. It’s easy and makes perfect pancakes every single time. But if you have the time to make even fluffier pancakes, there is one extra step you could do. Separate the egg whites from the egg yolks and whisk the egg whites until they are fluffy. Then the fluffy egg whites are folded into the batter, which results in an even fluffier pancake or lighter waffle. When I make waffles with this homemade waffle mix, I add extra oil to the batter. You can still get great waffles using the same recipe as the pancakes (really! ), but I find adding that extra oil, makes your waffles crispier and taste better. Since waffles are made in a waffle maker, you have high heat coming from both sides, unlike pancakes. The goal with pancakes is to make them fluffy and almost cake-like in texture. The goal with waffles is to make them crispy on the outside, and light and fluffy on the inside. So the heat from both sides helps achieve that crispiness. Extra fat in the waffle batter is crucial. The extra fat helps the waffle develop that crispy surface. Extra sugar helps with the caramelization of the waffle surface too. 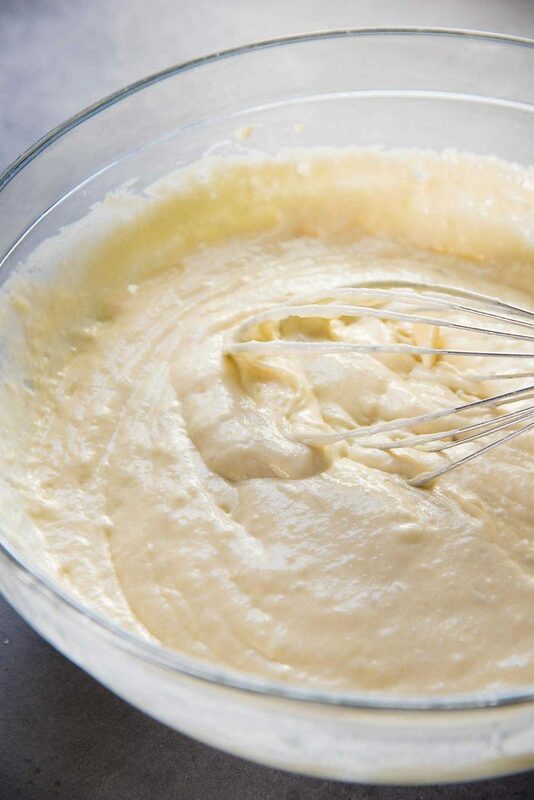 However, this batter is perfectly sweet, so I didn’t want to add any extra sweetness. The extra oil also makes the waffle batter runnier than the batter for pancakes. A looser batter makes for lighter waffles. This batter will expand in the waffle maker as it heats up, and the result will be crispy, light, waffle perfection! Want even fluffier waffles? You can separate the egg whites and whisk them to fluffy, soft peaks and then fold it into the batter. Do not over-mix the egg whites into the batter. So now you know how incredibly easy it is to make your own homemade pancake mix from scratch (or your own homemade waffle mix). 🙂 So there’s NOTHING stopping you from enjoying delicious pancakes or waffles whenever you feel like it, no matter what time of the day! Even your weekend breakfasts and brunches just got easier with this time saving DIY pancake mix! 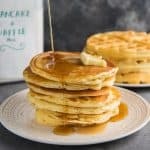 The BEST Homemade Pancake Mix from scratch that makes delightfully fluffy, light pancakes with a hint of sweetness that taste so much better than what you get with store-bought instant pancake mixes. Even better, this same mix also doubles up as a Homemade Waffle Mix to give you perfectly crispy, super light, scrumptious waffles too! Place all the ingredients in a food processor or blender. Pulse to blend well. Alternatively, SIFT all the ingredients into a very large bowl. Use a whisk to thoroughly mix the ingredients. Place all the ingredients in an air-tight jar or container. Store in a cool, dark place until needed. 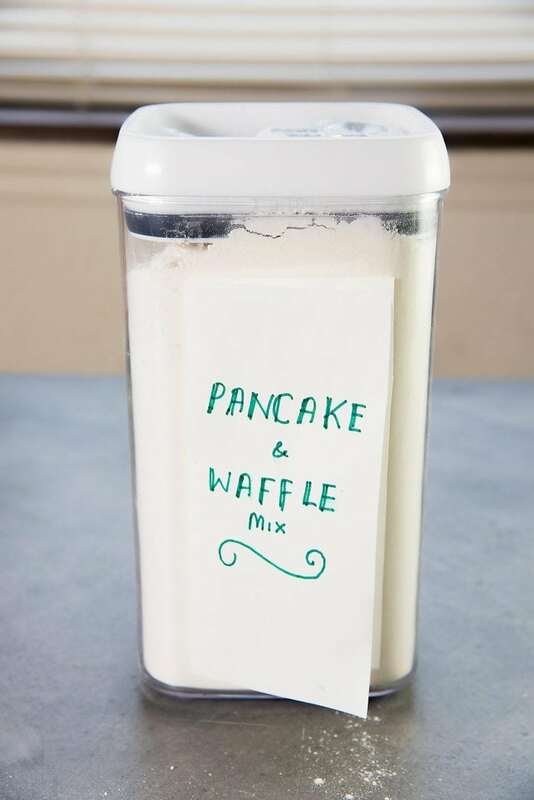 Print the label (click here for the label), that you can stick on your Pancake Mix / Waffle Mix jar. Place the pancake mix in a bowl. Create a well in the center. Add the milk, vanilla, butter and eggs. Stir just until you get a smooth, thick batter. DO NOT OVER-MIX. Heat a griddle or non-stick pan over medium heat. Add some oil to the heated pan. When the pan is hot, place ¼ cup of the pancake mix on the hot pan. Cook for a few minutes, until the edges are set, and you can see the bubbles on the surface. Carefully flip the pancake over and cook for a further few minutes until cooked through and they are dark golden brown in color. Serve with butter and maple syrup or anyway you prefer. Place the waffle mix in a bowl. Create a well in the center. Add the milk, vanilla, oil, butter and eggs. Stir just until you get a smooth batter. DO NOT OVER-MIX. Add up to 2 tbsp of extra water if the batter is too thick. Preheat waffle iron, and brush the iron with vegetable oil. Once heated, fill ¾ of the waffle iron with the waffle mix. Cook according to the waffle iron instructions. Serve with butter, maple syrup, or anyway you prefer. Note 1 - Weighing the pancake/waffle mix is the most accurate way of making sure you get perfect results. If you do use a cup to measure the mix, make sure to spoon the pancake mix into the measuring cup, until you over-fill the measuring cup. Scrape off the excess pancake mix with the flat side of a knife to level (see recipe video in the post). Note 2 - If you prefer to separate the eggs for this recipe, make sure to add the egg yolks along with the buttermilk and butter. Then you will need to add about 2 tbsp of extra water per batch to the batter, to compensate for the egg whites. Whisk the egg whites until you have soft fluffy peaks. Mix in ⅓ of the egg whites into the batter. Followed by just FOLDING IN the remaining ⅔ of the egg whites. DO NOT OVER-MIX. Some clumps of egg whites are preferred. 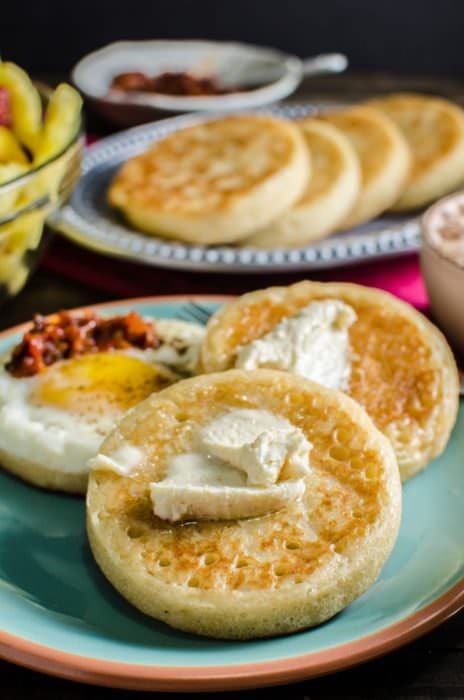 If you love breakfast as much as I do, you may love these recipes too! 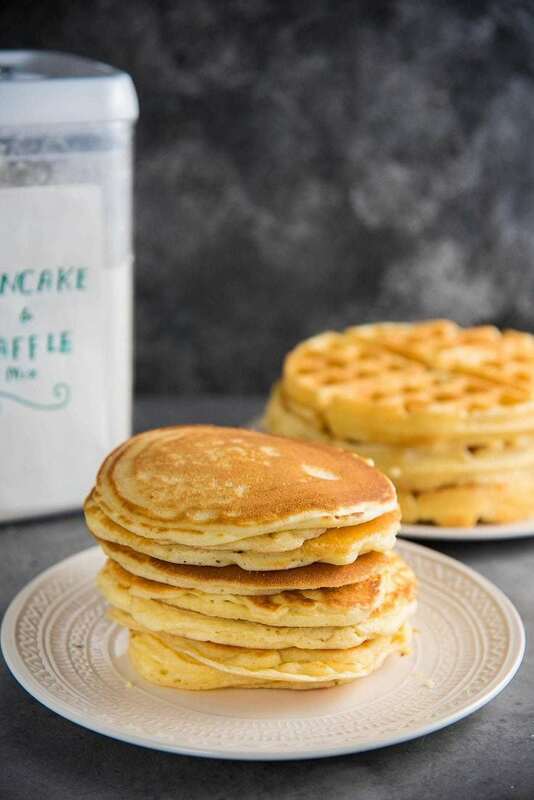 If you liked this homemade pancake mix (homemade waffle mix) recipe, don’t forget to subscribe for new (and free) recipes by entering your email address on the side bar (and get all these recipes delivered straight to your inbox), so you don’t miss out on a thing. You can find me on FACEBOOK, TWITTER,INSTAGRAM, PINTEREST, YOU TUBE and GOOGLE-PLUS too. Can I double the recipe for 8 batches? Also, can when I make the pancakes, can I double the amounts to make enough for 8 people? You can double the pancake mix to 8 batches, but I do highly recommend making each batch separately to make sure the ingredients are mixed uniformly. You can also make pancakes for 8 people at one go by doubling the amount of pancake mix too. I hope that helps, let me know if you have any other questions. Hi there! Can I use cornmeal instead of corn flour? If yes, can I use the cornmeal using the measurements above? Thanks! Unfortunately you can’t substitute corn meal for cornflour as they have completely different textures. The cornflour is added to make the pancake mix light, which will give lighter, fluffier pancakes. And the corn meal will make the batter heavier and add the flavor of corn meal as well, which will interfere with the classic flavor of pancakes. You can substitute the cornflour with rice flour, or potato starch instead of cornflour if you like. I have had some readers who have replaced the corn flour with regular AP Flour, and have had good results too (just a tad heavier batter). LOVE this pancake mix. Added some berries, turned out delicious! Our family loves pancakes and waffles anytime of day. Having this mix on hand is the best idea ever! I used your recipe to make waffles, but I used my gluten free flour blend and added fresh nutmeg. OOHHH MMYY!! Great job on a pretty universal recipe! Any idea how long the dry mix lasts in a glass jar? I’m thinking I should double the recipe (4 boys!) but I’m thinking we would make once/twice a week and am unsure if it would last 2-3 months ‘safely’. Thoughts? Thanks you! I have made pancakes with my mix that I’ve kept for about 1.5 months, once. They could last up to 2 months too, but my mix usually is over in 1 month because I only make single batches. My husband loved the waffles. They were great and easy to make. Thanks. Yay, I’m so glad, thanks so much for letting me know Regina! 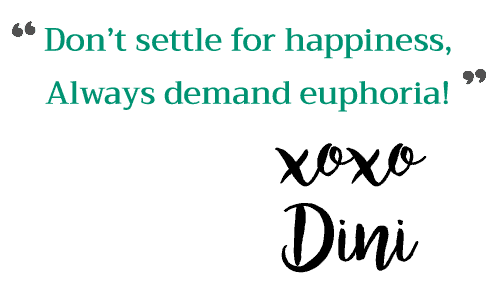 Hi Dini,I love your site! I noticed in one of the comments to the question of how long you can hold a mixed up batter in the fridge that you like to make each batch up totally ,because baking powder and baking soda will not stay fresh and will result into less fluffy pancakes.In your recipe I only saw baking powder no baking soda.I read that you didn’t add it so ppl that didn’t use buttermilk would be able to have fluffy pancakes with the soapy taste that baking soda can have.But you replied that both bk soda and bk powder together produces the fluffiest pancakes.I always use buttermilk,so if I wanted to add baking soda to my homemade mix how much would I use ? Your recipes look soooooo good I’m sure I will be visiting your site very often! I plan on making up a batch of this mix to have on hand for making some pancakes for my Grandchildren on Monday! Hi! How would you change the recipe if you wanted to use milk powder instead of milk? 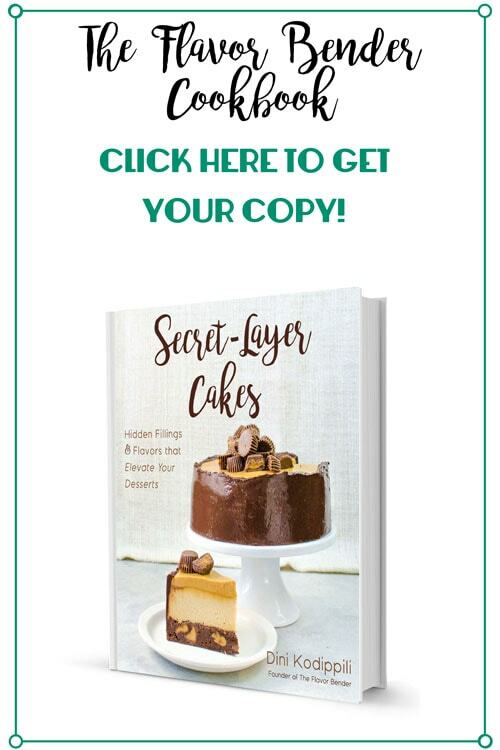 I haven’t used milk powder for this recipe, but I would follow the package instructions to make milk from the powder and use that instead of the milk in the recipe. can you add pumpkin filling to this mix to make these pumpkin pancakes? How would you change the rest of the recipe if so? You can adapt this to make pumpkin pancakes easily! Instead of 1 1/2 cups of buttermilk, you can add 1 1/4 cup of buttermilk and 1/2 cup of pumpkin puree. Plus I add 1 tsp cinnamon, 1/2 tsp ginger powder, 1/4 tsp cloves and 1/8 tsp nutmeg to the flour mix as well (or 2 tsp pumpkin pie spice). This mix doesn’t make the crispiest waffles (unfortunately). 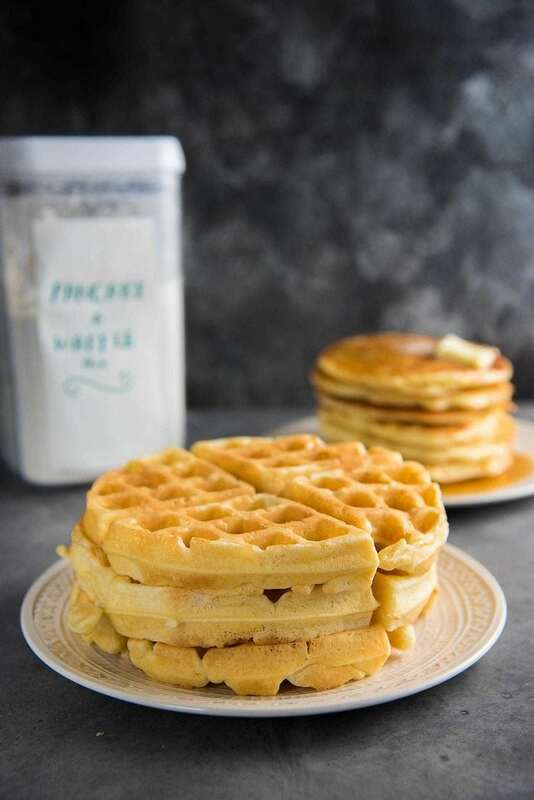 To get crispier results with the waffle batter, you can whisk the egg whites to soft peaks, and fold them in at the end (separate from the egg yolks), and add a little extra milk or buttermilk to thin out the batter (about 1/4 – 1/2 cup). Usually, the lighter the batter, the crispier the results. However, the crispiest waffles are always yeasted waffles, which is a little more work. Thank you for a great recipe! I made these last weekend and they were delicious! I made some into “apple pie” pancakes, with cooked apples, cinnamon, brown sugar and maple syrup. I will make these into waffles next time. Hi, thanks for the great recipe! Just one quick question: can i store leftover batter in the fridge? If yes, for how long? I usually try to only make one batch at a time because the baking powder and baking soda will lose their freshness after a while, and you won’t get the fluffiest pancakes. The most I have left my batter in the fridge was 12 hours, and the pancakes weren’t as fluffy as when freshly made. I made only 1 batch but even that was too much for my family of 3. I made the batter Friday night and used it 3 times, from Friday night (apple pie pancakes as dessert) to Sunday morning and they seemed to be fluffy and delicious. I used the “folding in egg whites” method. But I wouldn’t let it sit in the fridge for any longer than 2 days. I just cooked up all the batter and put the uneaten pancakes in the freezer for later consumption. This is awesome! What a great post! These pancakes look fantastic. Now I am craving some. I love that this is a two for one recipe! Thanks so much for all the info!